BAD DREAMS: The Dangerous Side-Effects Of Krueger Envy – Schlockmania! The success of A Nightmare On Elm Street opened a whole new world for the horror filmmakers of the 1980’s. 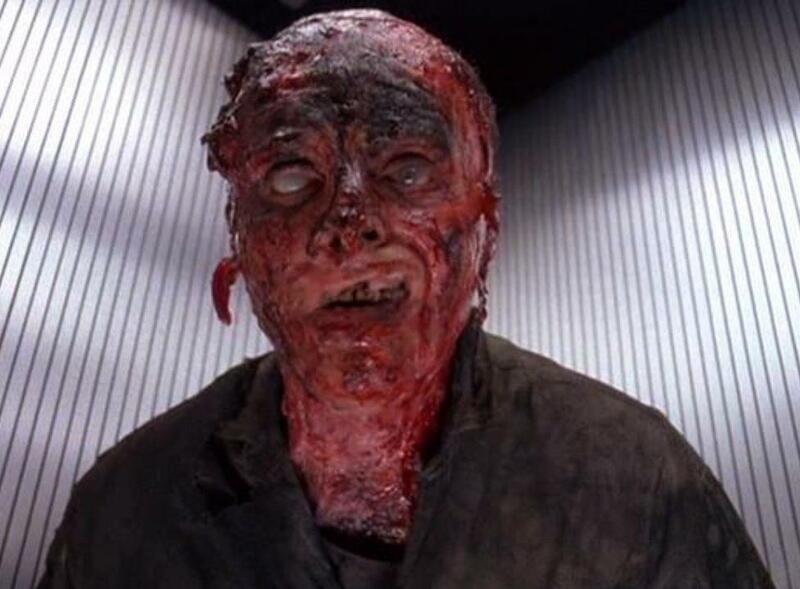 Not only did Wes Craven’s influential hit show them a way to put an imaginative spin on the standard slasher-flick cliches, it also offered a template that would allow filmmakers to work in added doses of surrealism into their visuals. 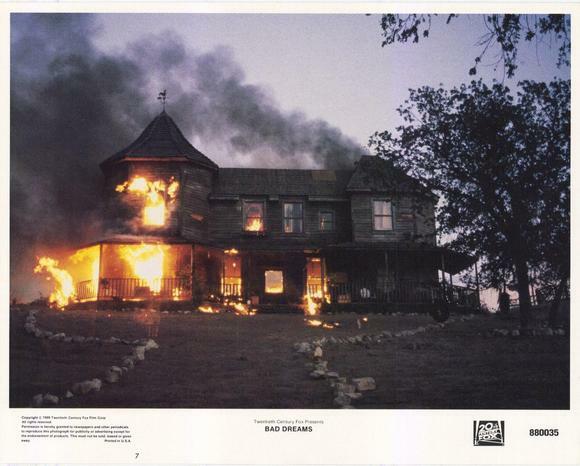 As a result, the success of the first Nightmare was followed by an array of dream-killer flicks: The Dream Demon, Dreamaniac and Deadly Dreams are a few examples. 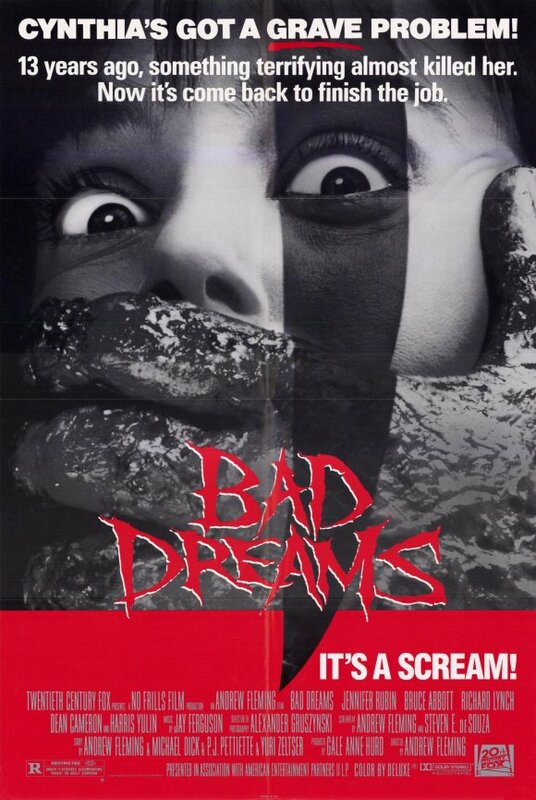 However, none of the aforementioned Nightmare knock-offs ever wore their Krueger envy as prominently as Bad Dreams. 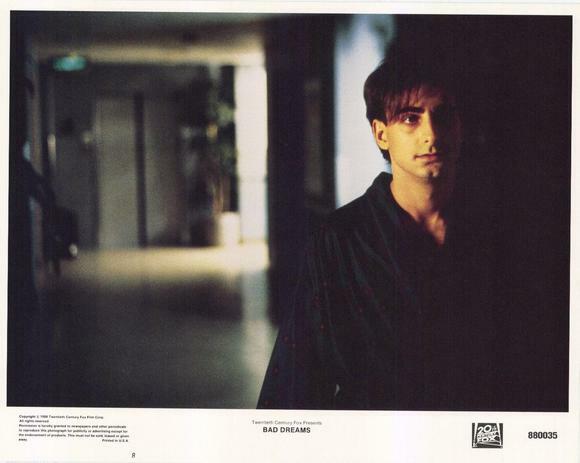 In fact, this Gale Anne Hurd production cops from the Nightmare franchise twice over: not only does it feature a deceased psycho returning as a boogieman dream-killer, it also features a premise where said dream-killer going after a group of mental hospital patients – which is a lot like A Nightmare On Elm Street 3: Dream Warriors. For added shock potential, it also works in elements of real-life terrors like Charles Manson and Jim Jones. It’s a potent stew of ingredients but unfortunately for horror fans, Bad Dreams is less than the sum of its parts. The Nancy-style heroine of this film is Cynthia (Jennifer Rubin, who ironically happens to be a Nightmare 3 alum). 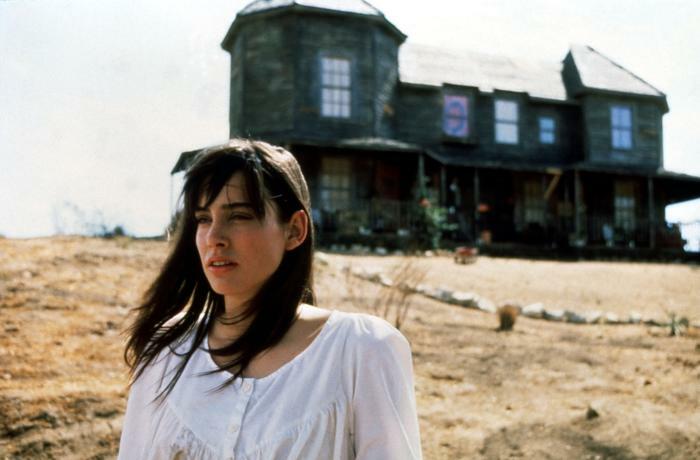 She’s the lone survivor of a cult’s mass suicide, an event instigated by their Manson-ish leader Harris (Richard Lynch) in the film’s prologue. She awakens 13 years later in a world where she knows no one and is hopelessly out of touch. 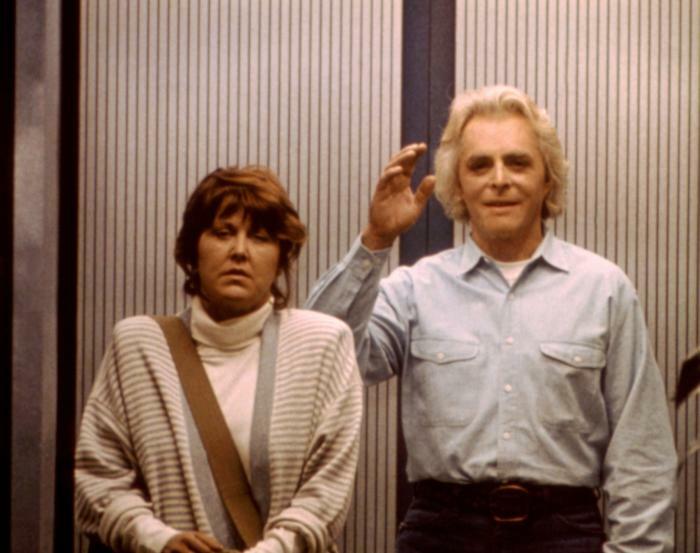 The hospital’s head psychiatrist Dr. Berrisford (Harris Yulin) diagnoses her with borderline personality disorder and places her in a therapy group of similar patients that is handled by his assistant, Dr. Karmen (Bruce Abbott). Unfortunately for everyone involved, Harris is not yet finished with Cynthia. He begins intruding on her reality, appearing to her in ways that others cannot see. When she doesn’t willingly “return” to him by committing suicide, he turns his attentions to the other members of her therapy group and starts bumping them off. It’s up to Cynthia and Dr. Karmen to figure out a way to stop her past from slaughtering her present – and the ultimate solution is trickier than either could imagine. Derivative as it might be, this premise could have worked if handled in the right way. Unfortunately, Bad Dreams is a mess where all the signs point towards excessive studio tampering: it’s suspiciously short (80 minutes without the credits) and has a hastily reshot ending that just doesn’t work. Without getting into spoilers, it also suffers from a final twist that, while unexpected, effectively undoes any of the worthwhile elements that preceded it for a cheap “gotcha”-style plot twist. And what’s missing from the film isn’t its only problem. Bad Dreams‘ simulataneously overcooked and underthought script is plotted in a rickety manner: for example, Cynthia is placed in the therapy group before she shows any signs of being maladjusted when it would have been simple to make this plot device work by allowing her to have a Harris-induced freakout that would make her seem crazy. It doesn’t help that the characterizations are either slim (Dr. Karmen, Cynthia) or a series of cheap grotesques that pander to the movie cliché version of a mental patient (every other member of the therapy group). On the plus side, Bad Dreams has an unusually good cast for a horror film: Rubin and Re-Animator alum Abbott work hard in their respective roles and the presence of vets like Yulin and Alex Cox regular Sy Richardson as a cop add a touch of gravitas. Unfortunately, the script never gives any of them a vehicle for their efforts. Lynch is quite good as the villain, selling the character’s psycho-messianic mindset with an eerie sense of calm. As for the rest of the patients, they’re all enacted in a pretty shrill manner but Dean Cameron, better known for comedies like Summer School, gives a pretty bravura turn as the smart-aleck of the bunch. The best element of Bad Dreams is the direction of Andrew Fleming. He orchestrates the setpieces with gusto and shows a gift for stylization, handling the shifts between past and present in the hallucination scenes with real imagination. Highlights of his work here include a scene where a steamy shower room gives way to a depiction of a nocturnal baptism, an extended flashback to the fiery mass suicide and a really unnerving moment involving a car used as a murder weapon. It’s a shame the script, which he must take blame for as a co-writer, doesn’t come up with a better framework for his stylistic flourishes. Ultimately, Bad Dreams is a forgettable by-product of A Nightmare On Elm Street‘s success. Patient 1980’s horror buffs might find it worth a spin for Lynch’s performance and its handful of crafty shocks but the film is ultimately too derivative and disjointed to compete with its inspiration. I always LOVED Bad Dreams and considered it a pretty good, nasty little horror film. I never knew it was one of those edited and refilmed by committee films….and I’d love to see it the way it was intended. Too bad film preservation mainly extends to popular hits. Maybe one day a Synapse Films (are they still in business?) release….. Check out the DVD – it includes an alternate ending that is more interesting, less abrupt and, yes, much more nasty than what ended up in the film. Sadly, the footage is taken from an old workprint video source instead of the actual footage but it’s watchable and worth the time. I remember when this played theaters in the late 80s(and was as vastly hated as many of the genre films released around that time period),for it’s pretty much now a decent film compared to the remakes,sequels,remakes,retreads,and more remakes that are nowadays made(and out there). And yes,Donald C.: Synapse Films is still alive and well. And the only thing that I really hated about the film was Gun N’ Roses’ “Sweet Child O’ Mine” being played at the end credits.